Prime Minister Hon. Allen Chastanet of Saint Lucia (second from right); CARICOM Secretary-General Ambassador Irwin LaRocque (l); Antigua and Barbuda’s Minister of Foreign Affairs, International Trade and Immigration Hon. 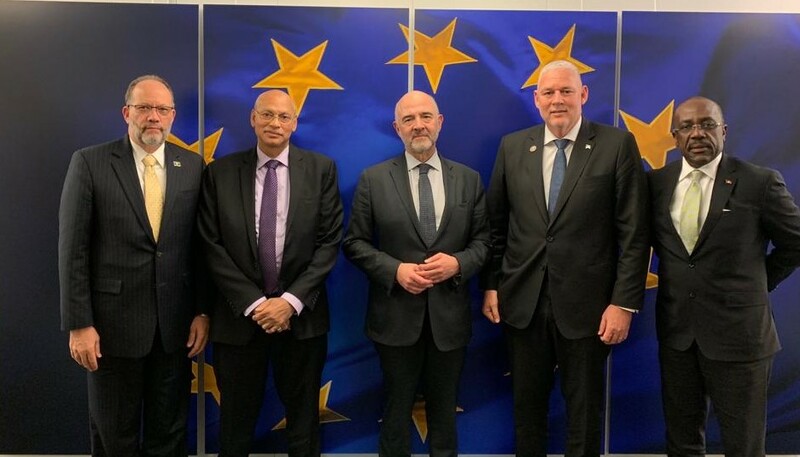 Chet Greene (right), and Barbados’ Minister of International Business and Industry Hon Ronald Toppin (second from left) share a photo with EU Commissioner for Economic and Financial Affairs, Taxation and Customs Pierre Muscovici (center) following a meeting on Feb. 21 in Brussels. BASSETERRE, St. Kitts — The complexity of the European Union’s (EU) blacklisting process that labels some CARICOM member states as non-cooperative tax jurisdictions has been decried by CARICOM Secretary-General, Ambassador Irwin LaRocque, as a persistent threat to development in the region. “This was denied to us previously. It demonstrates Romania’s openness to dialogue and to get an understanding of the position of our member states,” the top CARICOM diplomat said.